Mr. Don Tuck has a B.S. Degree in Education and an M.S. in Educational Administration. He also holds certification via the State of Missouri in the area of teaching and K-12 administration. Over the course of his 34 plus years in education he has served as a public school teacher and high school principal. 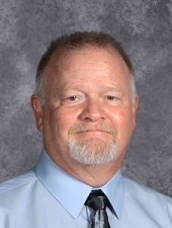 Mr. Tuck came to New Covenant Academy in 2013 to serve as Middle School science, health, and Middle School Bible instructor, before accepting the 5-8 Principal position for the 2015-16 school year. After serving in public and private education for the past 34 years, I have learned that the thing that has had the greatest impact on me has been the relationships that have been built during that span of time. Relationships with other brothers and sisters in Christ, relationships with fellow teachers and administrators, relationships with current and former students, parents, and patrons, and most importantly, my personal relationship with Christ has shaped who I am. Relationships are a huge part of New Covenant Academy’s profile. Relationships were a big part of Jesus’ ministry to those whose lives he touched and we encourage the NCA family to invest in others, learn from others, and do what we can to impact the lives of those we interact with daily. We certainly take pride in our academic program here at NCA, but serving others is truly what we are all about. It is great to be a Warrior!